Even as India gears up to welcome Seychelles President Danny Faure to a state visit here on June 25, Seychelles has cancelled the agreement with India to build a military facility on Assumption Island. He said that he would not discuss the Assumption Island project with PM Narendra Modi when he visits Delhi. He also mentioned that Seychelles will develop military facilities at the island on its own. A defence portal said Seychelles might be looking at a maritime security deal with France instead. The agreement that was signed with India in 2015 to develop a naval facility at Assumption Island which would have given India strategic advantage in Indian ocean Region (IOR). The proposal to have ‘lateral entry’ in government posts was denied by PM Narendra Modi also. Even former Prime Minister Manmohan Singh was a vocal advocate of lateral entry. Lateral entry is a well-established principle across the world and is universally acknowledged by experts to catalyse greater governance, efficiency, professionalism and specialised, cutting-edge experience in public administration. There is no single ‘special’ law to bring those accused of lynching incidents to book. Jurists say police must assemble a bouquet of charges to hold the case together. Lynching being no ordinary murder (Sec 302), police must also invoke other criminal charges such as common intention (Sec 34) and being present and abetting an offence punishable with death (Sec 114). “While murder, read with common intention and abetment, forms the bedrock, police can invoke conspiracy charges against those who orchestrated the lynching or invoke IT Act 66A against those who created the content and spread it on social media,” said former additional solicitor-general of India P Wilson. Former special public prosecutor for Tamil Nadu’s human rights court V Kannadasan says leaving out the ‘conspiracy’ portion helps the prosecution since most lynchings are not premeditated. With New Delhi’s application before the Nuclear Suppliers Group (NSG) in Latvia, the NSG, after a two-day meeting on June 14th and 15th, said that it discussed NSG relationship with India and continues to consider all matters pertaining to implementation of the 2008 NSG waiver for India. In fact, two years after India first approached the NSG plenary in Seoul, the group noted that discussions were continuing on the requests for participation that had been submitted. 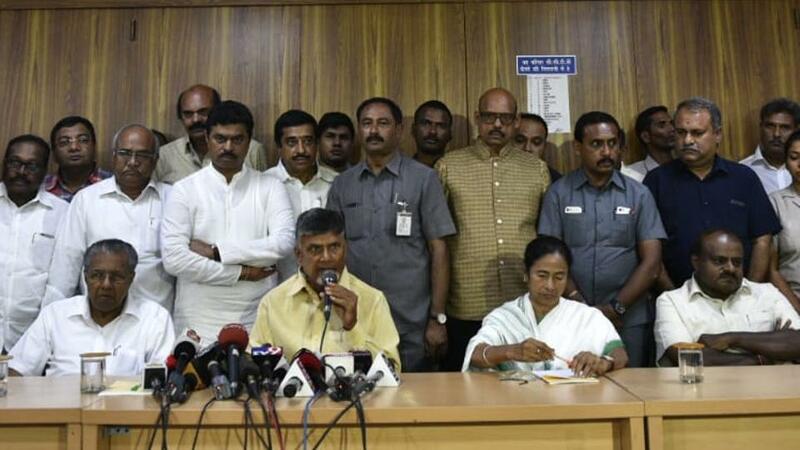 Pinarayi Vijayan of Kerala, N Chandrababu Naidu of Andhra Pradesh, Mamata Banerjee of West Bengal and H D Kumaraswamy of Karnataka at a press conference to express their solidarity with Chief Minister of Delhi, Arvind Kejriwal. Chief Ministers of four states took up their Delhi counterpart Arvind Kejriwal’s continuing dharna at Raj Niwas with Prime Minister Narendra Modi on the sidelines of the meeting of the NITI Aayog Governing Council Sunday. Mamata Banerjee of West Bengal, N Chandrababu Naidu of Andhra Pradesh, H D Kumaraswamy of Karnataka, and Pinarayi Vijayan of Kerala sought Modi’s intervention in ending the “constitutional crisis” in Delhi. Kejriwal and three of his ministers have been sitting in at the office of Delhi’s Lieutenant Governor for the past week to press their demand that the L-G should get the capital’s striking government officials back to work. Kejriwal did not attend NITI Aayog meeting. Despite the recurring strife in bilateral ties, India and Pakistan continue to work together on humanitarian issues. Official sources said India will release five more Pakistani prisoners on Tuesday. Pakistan has been seeking the release of 54 prisoners who, it says, have completed their sentences. India and Pakistan had in March agreed to release women prisoners and those above 70 years of age. The agreement arrived at over the humanitarian issue of prisoners resulted from a meeting between foreign minister Sushma Swaraj and Pakistani high commissioner Sohail Mahmood in 2017. Prime Minister Narendra Modi at the meeting of the NITI Aayog asked states to set ambitious growth targets for their economies, saying the world expected India to become a $5 trillion economy even as he emphasised on the need to reach welfare schemes to the last beneficiary. The PM advised states to pay special attention to expanding their exports and attracting export oriented investments while organising investment summits. Greece and Macedonia defield protests and set aside three decades of dispute as they agreed to rename Balkan state, potentially paving the way for Macedonia’s admission to the European Union and NATO. The Foreign Ministers of Greece and Macedonia signed an accord to rename the former Yugoslav Republic the “Republic of North Macedonia”. The first Indian student mission to the Moon is set to lift off in 2019, said Vinay Bhardwaj and Yagna Sai of Chennai-based Space Kidz India (SKI), which launched the world’s first tiniest and lightest satellite, KalamSat, from a Nasa-sounding rocket in 2017. 1. Based on which issues have India and Pakistan agreed to work together? 2. What was the advice given by the PM Narendra Modi to states at the meeting of NITI Aayog? 3. What is the new name given to the Yugoslav Republic? 4. Which is the India first Student Mission to Moon?